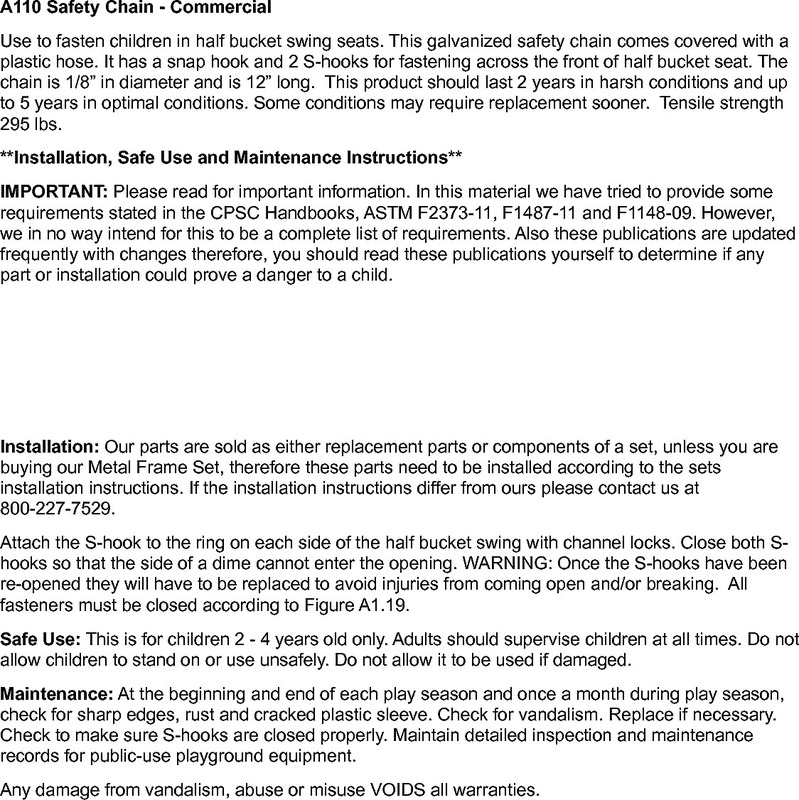 Installation: Our parts are sold as either replacement parts or components of a set, unless you are buying our Metal Frame Set, therefore these parts need to be installed according to the sets installation instructions. Attach HOSE to wood or pipe using sufficiently long zip ties approximately every foot.Make sure that there are sufficient zip ties and that they are tight enough so that the HOSE is flush with wood or pipe and cannot be pulled away as this could cause an entrapment and possible strangulation. Safe Use: This is for children 5 - 12 years old only.Adults should supervise children at all times.Do not allow children to use unsafely.Do not allow it to be used if damaged. Maintenance: At beginning and end of each play season and a once a month during play season, check for Sharp edges and/or cracked plastic.Make sure that HOSE is still flush to pipe or wood and cannot pose an entrapment.Check for vandalism.Replace parts as necessary.